Join us as David (The Bow Tie Jedi Guy) passes on a legacy of Star Wars passion to his two sons, Samuel the Hutt, and BB-N8! If you've ever sat around with your kids talking about Obi Wan Kenobi, Luke Skywalker, Jar Jar Binks, The Clone Wars and Star Wars Rebels, or anything from the Star Wars universe, this is the podcast for you! 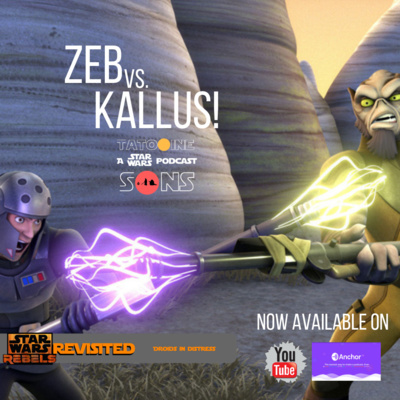 SPECIAL EPISODE: The Clone Wars Season 7 with Blue Saber Podcast! 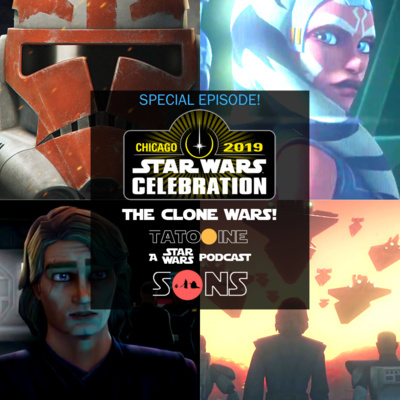 We're honored to be joined by JG Carse of Blue Saber Podcast to breakdown what we learned in The Clone Wars Season 7 panel at Star Wars Celebration! What is 1313 and what does it mean to The Clone Wars Season 7? Sam Witwer talks about why the Siege of Mandalore is the story he's been waiting to tell. Ahsoka and Anakin's tragic relationship. New details about the return of Maul And more! Follow us on Twitter! Like us on Facebook! Check out our Instagram! A PROUD member of the Star Wars Commonwealth Podcast Network! SPECIAL EPISODE: The Mandalorian with Blue Saber Podcast! 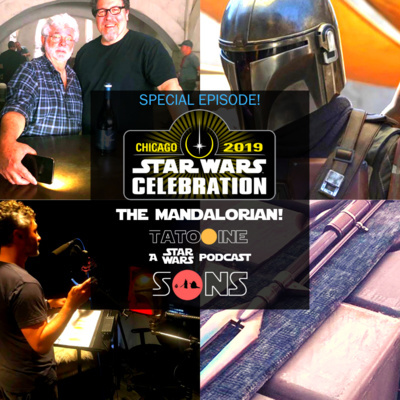 We're honored to be joined by JG Carse of Blue Saber Podcast to breakdown what we learned in The Mandalorian panel at Star Wars Celebration! When will the show premiere? Will it be released all at once, or weekly? What's the show all about? Did we see footage? We share all this and more! Follow us on Twitter! Like us on Facebook! Check out our Instagram! A PROUD member of the Star Wars Commonwealth Podcast Network! We FINALLY have the title of Episode IX! It's The Rise of Skywalker! And in this SPECIAL Star Wars Celebration Episode, we have Adam Lance Garcia, Yahoo! Entertainment Producer and The Last Jedi EVANGELIST on to break it all down. Who is the "Skywalker" the title is referring to? What about that cackle at the end? Was that really the Death Star? And more! PLUS! We had a SURPRISE GUEST drop in at the end to give his take on the panel, title, and trailer! This is one podcast you WON'T want to miss! It's TIME for Tatooine Sons! Follow us on Twitter! Like us on Facebook! Check out our Instagram! A PROUD member of the Star Wars Commonwealth Podcast Network! SPECIAL EPISODE! The Rise of Skywalker Teaser Breakdown with Chatter Squadron! 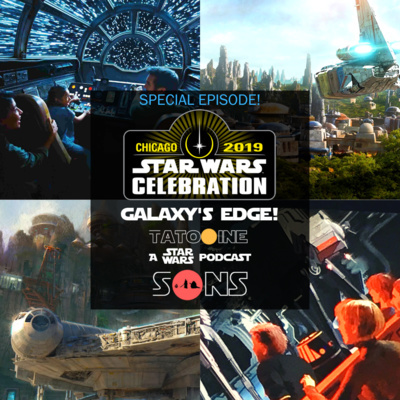 We are THRILLED to welcome Chatter Squadron Podcast to the show to discuss everything we know about The Rise of Skywalker! 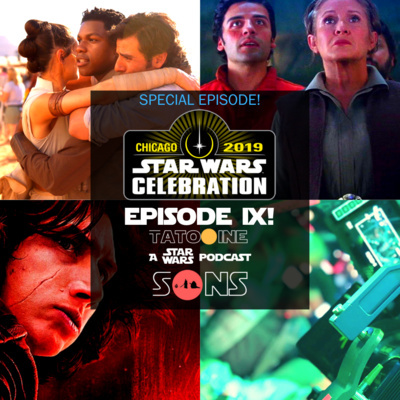 Join us for a fun, raw, and exciting conversation as we dive deep into the Episode IX panel from Star Wars Celebration Chicago! Follow us on Twitter! Like us on Facebook! Check out our Instagram! A PROUD member of the Star Wars Commonwealth Podcast Network! 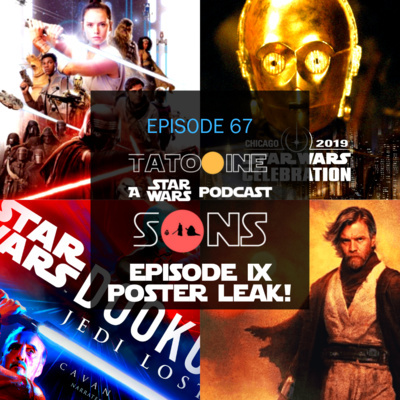 SPECIAL EPISODE: Jason Fry Talks The Last Jedi, The Rise of Skywalker & Terbus the Porg! 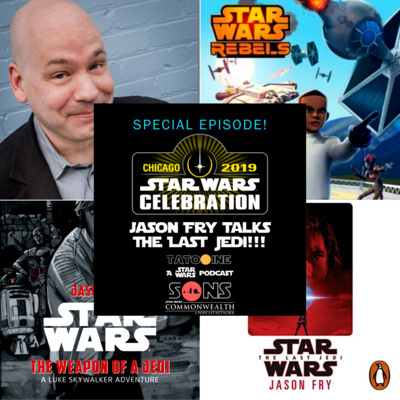 Welcome to this VERY special episode of Tatooine Sons as we interview Jason Fry, author of numerous Star Wars titles including The Last Jedi, The Weapon of Jedi and Moving Target! Jason share about his collaboration with Rian Johnson (Writer/Director of The Last Jedi), criticisms of the film and novel, and more including: Why he felt it was important to write the prologue in the novel The fun of including L3 from Solo: A Star Wars Story in the story How Luke Skywalker is consistent in the story Follow us on Twitter! Like us on Facebook! Check out our Instagram! A PROUD member of the Star Wars Commonwealth Podcast Network! Not much information came out today at the Galaxy's Edge Panel at Star Wars Celebration. But what we've learned, you'll get here! Follow us on Twitter! Like us on Facebook! Check out our Instagram! A PROUD member of the Star Wars Commonwealth Podcast Network! We had front row (well...almost) seats for all the action as Amy Ratcliffe discussed the conclusion of Star Wars: Rebels with Executive Producer, Dave Filoni, and cast members Vanessa Marshall (Hera Syndulla), Taylor Gray (Ezra Bridger) and Tiya Sircar (Sabine Wren). Were there any revelations? IS there more coming to the story? We share what we learned! Follow us on Twitter! Like us on Facebook! Check out our Instagram! A PROUD member of the Star Wars Commonwealth Podcast Network! 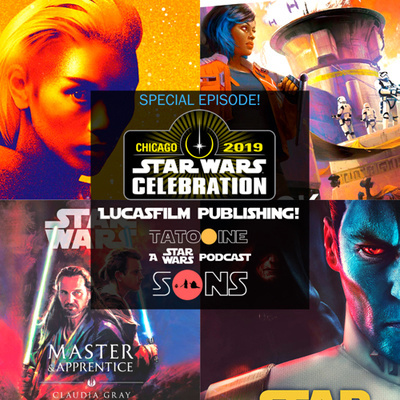 We’re breaking down all the big details from the Lucasfilm Publishing Panel, including: Cardinal is BACK in Black Spire by Delilah Dawson Claudia Gray wants to bring KOTOR into the new canon Some new info about Thrawn: Alliances The Road to The Rise of Skywalker And more! Check out our special offer for new Patreon Jedi Masters! Offers expires on May the Fourth (be with you!) Follow us on Twitter! Like us on Facebook! Check out our Instagram! A PROUD member of the Star Wars Commonwealth Podcast Network! 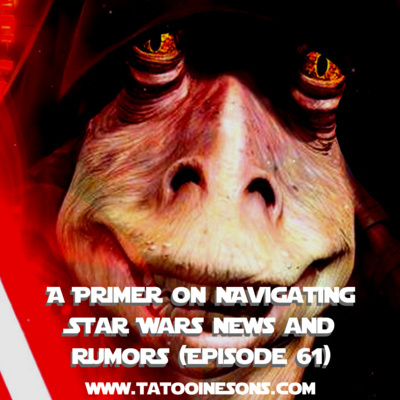 Welcome Star Wars fans to Episode 67 of Tatooine Sons! We’re only 2 weeks away from the greatest fan event in the galaxy, and Star Wars fandom is itching for any Episode IX news. Well, we might have gotten some this week. We’ll discuss the mini-leak and what it means… if it’s real. Plus, we’ve got the latest Star Wars Celebration news, our Hot Takes, and more! This is Madness! It’s TIME for Tatooine Sons! 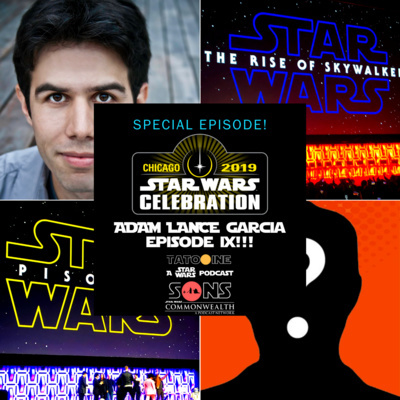 TIME STAMPS: 00:00:00 - Intro/Banter 00:10:42 - Last Week's Podcast Poll Results 00:20:15 - Star Wars Celebration Chicago Update 00:33:50 - Hot Takes! 00:49:51 - Episode IX Poster Leak Discussion 01:18:18 - Anything Else?/Outro Check out our website! Subscribe to our YouTube Channel! Sponsors us on our Patreon page! Follow us on Twitter! Like us on Facebook! Check out our Instagram! A PROUD member of the Star Wars Commonwealth Podcast Network! 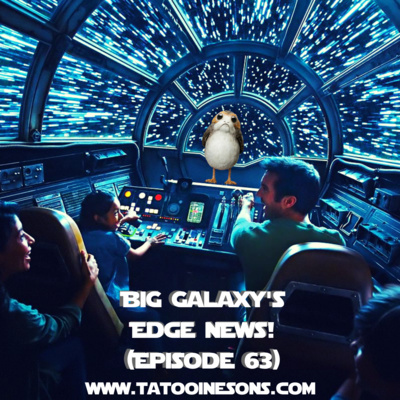 Welcome Star Wars fans to Episode 66 of Tatooine Sons! This week, we’re going to provide a public service to all fans attending Star Wars Celebration! We’ve got the latest in schedules, meetups, podcasts and and show floor news. Along with all the info we can about the lottery system, and some tips for first timers. And of course, we’ll break down the season finale of Resistance and give our Hot Takes. Execute Episode 66! It’s TIME for Tatooine Sons! TIME STAMPS: 00:00:00 - Check out ALL the Star Wars Commonwealth Podcast Network Shows 00:00:42 - Show Intro & Banter 00:09:45 - Last Week's Podcast Poll Results 00:14:14 - Resistance Recap - No Escape Part 2 00:26:50 - Hot Takes! 00:45:33 - Star Wars Celebration Preparation! 01:28:52 - Anything Else? Check out our website! Subscribe to our YouTube Channel! Sponsors us on our Patreon page! Follow us on Twitter! Like us on Facebook! Check out our Instagram! A PROUD member of the Star Wars Commonwealth Podcast Network! 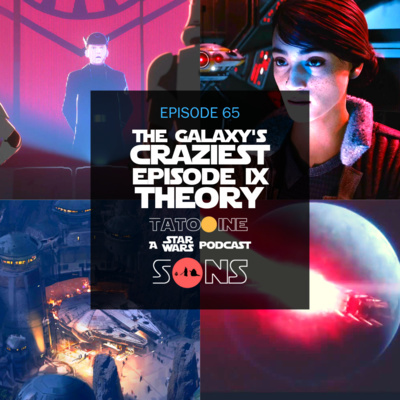 Welcome Star Wars fans to Episode 65 of Tatooine Sons! We’re all excitedly waiting for the finale of Star Wars: Resistance, along with all the additional revelations coming in a few weeks at Star Wars Celebration! While we’re trying to remain patient, we’ve decided to take a deep-dive into the Resurrection DLC of Star Wars Battlefront 2 - specifically whether or not we think that it will impact the storyline of Episode IX. And of course we’ll give more thoughts on the season finale of Star Wars: Resistance and our always fun Hot Takes. Never tell me the odds! It’s TIME for Tatooine Sons! ---------------------------------------- TIME STAMPS: 00:00:00 - Check out ALL the Members of the Star Wars Commonwealth Podcast Network! 00:00:43 - Intro/Banter/Last Week's Podcast Poll Results? 00:14:40 - Resistance Recap - No Escape (Part 1) 00:37:51 - Hot Takes - Poe's Big Mouth/An Episode IX Announcement/Frank Oz Knows Yoda 00:55:11 - The Galaxy's CRAZIEST Episode IX Theory! 01:18:26 - Anything Else/Outro/Thanks for Watching! Check out our website! Subscribe to our YouTube Channel! Sponsors us on our Patreon page! Follow us on Twitter! Like us on Facebook! Check out our Instagram! A PROUD member of the Star Wars Commonwealth Podcast Network! It's been 1 year since the amazing series finale of Star Wars: Rebels! All throughout social media, fans are celebrating the series using #RebelsRemembered! - Why do we LOVE Star Wars: Rebels? - Who's our favorite character? - What's our favorite episode? - What's our favorite storyline? - What's our favorite season? AND MORE! 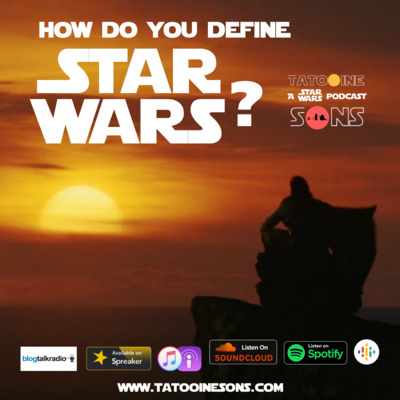 Music: https://www.bensound.com Check out our website: https://www.tatooinesons.com/ Subscribe to our podcast: https://www.spreaker.com/show/tatooin... Check out our Patreon page: https://www.patreon.com/tatooinesons Follow us on Twitter: https://twitter.com/TatooineSons Like us on Facebook: https://www.facebook.com/TatooineSons Check out our Instagram: https://www.instagram.com/tatooinesons A PROUD member of the Star Wars Commonwealth Podcast Network: https://www.starwarscommonwealth.com Star Wars: Rebels REVISITED is a weekly, 30 minute look at Star Wars: Rebels! WE believe this is the BEST Star Wars animated series, and we plan on proving it to you episode-by-episode and theme by theme! 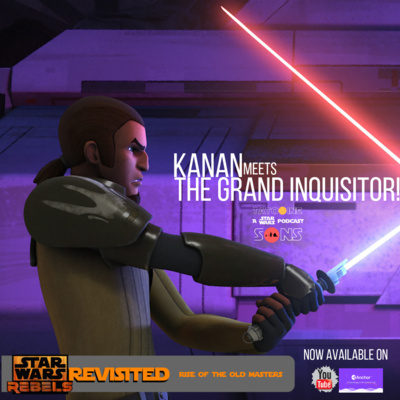 Kanan continues to train Ezra in the ways of the Force, but both become frustrated with each other and their new roles. Meanwhile, an underground transmission reveals that a Jedi Master, long thought dead, is alive and in Imperial custody. 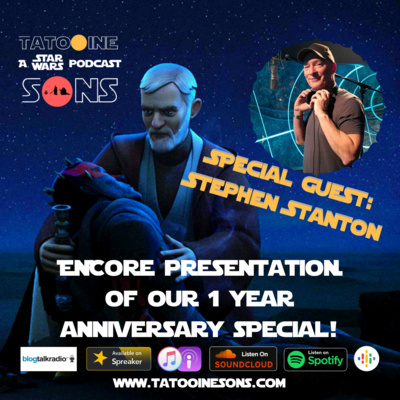 Check out our website: https://www.tatooinesons.com/ Subscribe to our podcast: https://www.spreaker.com/show/tatooin... Check out our Patreon page: https://www.patreon.com/tatooinesons Follow us on Twitter: https://twitter.com/TatooineSons Like us on Facebook: https://www.facebook.com/TatooineSons Check out our Instagram: https://www.instagram.com/tatooinesons A PROUD member of the Star Wars Commonwealth Podcast Network: https://www.starwarscommonwealth.com Star Wars: Rebels REVISITED is a weekly, 30 minute look at Star Wars: Rebels! WE believe this is the BEST Star Wars animated series, and we plan on proving it to you episode-by-episode and theme by theme! A simple supply run for hard-to-find meiloorun fruit takes a dangerous turn, as Zeb and Ezra draw the attention of Imperials...and steal a TIE fighter! 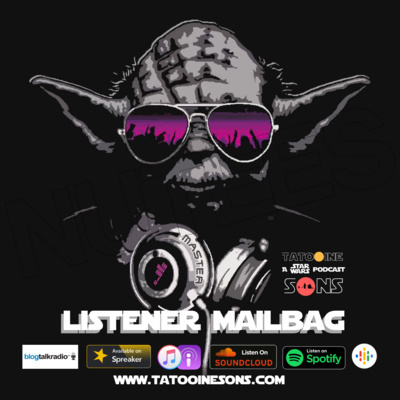 Check out our website: https://www.tatooinesons.com/ Subscribe to our podcast: https://anchor.fm/tatooine-sons Check out our Patreon page: https://www.patreon.com/tatooinesons Follow us on Twitter: https://twitter.com/TatooineSons Like us on Facebook: https://www.facebook.com/TatooineSons Check out our Instagram: https://www.instagram.com/tatooinesons A PROUD member of the Star Wars Commonwealth Podcast Network: https://www.starwarscommonwealth.com Star Wars: Rebels REVISITED is a weekly, 30 minute look at Star Wars: Rebels! WE believe this is the BEST Star Wars animated series, and we plan on proving it to you episode-by-episode and theme by theme! Everyone remembers "Droids in Distress" because of R2-D2 and C-3PO. But this episode is all Zeb and Kallus. Agent Kallus reveals to Zeb a secret about the genocide of the Lasat race. But what will happen over the course of the next four seasons is the really amazing part. Check out our website: https://www.tatooinesons.com/ Subscribe to our podcast: https://anchor.fm/tatooine-sons Check out our Patreon page: https://www.patreon.com/tatooinesons Follow us on Twitter: https://twitter.com/TatooineSons Like us on Facebook: https://www.facebook.com/TatooineSons Check out our Instagram: https://www.instagram.com/tatooinesons A PROUD member of the Star Wars Commonwealth Podcast Network: https://www.starwarscommonwealth.com Star Wars: Rebels REVISITED is a weekly, 30 minute look at Star Wars: Rebels! WE believe this is the BEST Star Wars animated series, and we plan on proving it to you episode-by-episode and theme by theme! Ezra Bridger has been captured by Agent Kallus and is imprisoned on an Imperial Star Destroyer! Will the Ghost Crew come back for him? 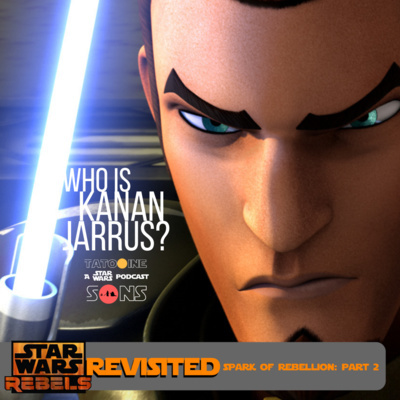 Who is Kanan Jarrus? And why does he have a lightsaber and Jedi holocron? 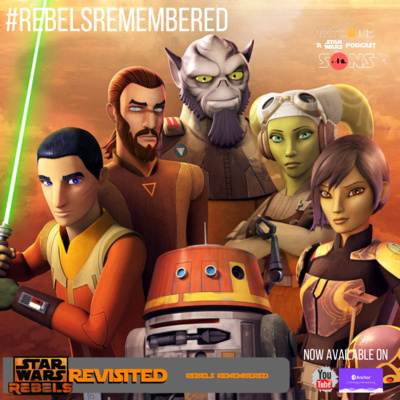 Join us for Episode 2 of Star Wars: Rebels REVISITED! 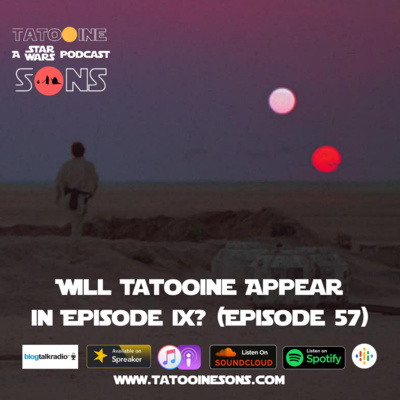 Check out our website: https://www.tatooinesons.com/ Subscribe to our podcast: https://www.spreaker.com/show/tatooin... Check out our Patreon page: https://www.patreon.com/tatooinesons Follow us on Twitter: https://twitter.com/TatooineSons Like us on Facebook: https://www.facebook.com/TatooineSons Check out our Instagram: https://www.instagram.com/tatooinesons A PROUD member of the Star Wars Commonwealth Podcast Network: https://www.starwarscommonwealth.com Star Wars: Rebels REVISITED is a weekly, 30 minute look at Star Wars: Rebels! WE believe this is the BEST Star Wars animated series, and we plan on proving it to you episode-by-episode and theme by theme! Welcome to the FIRST episode of Star Wars: Rebels REVISITED, where we meet Ezra Bridger, Kanan Jarrus, and the rest of the crew of the Ghost. Who is this orphan from Lothal? How is he able to do some of these crazy things? Why is this crew trying to steal weapons from the Empire? And what in the Force is the reason they've been brought together? Time Stamps: 00:00 - Check out all the Star Wars Commonwealth Podcast Network Shows! 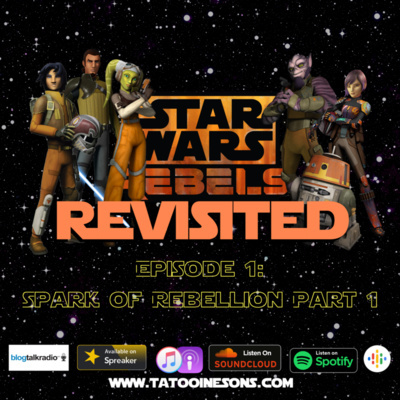 00:43 - Star Wars: Rebels REVISTED Intro 01:39 - Overview of this NEW Podcast Series! 10:00 - Recap of "Spark of Rebellion - Part 1" 14:01 - Our Reactions to this Episode! 19:23 - Clip: Kanan's Lightsaber Calls to Ezra 20:36 - Discussion of the BIG Revelation of this Episode 30:54 - May the Force Be With You! Check out our Website: https://www.tatooinesons.com/ Check out our Patreon page: https://www.patreon.com/tatooinesons Follow us on Twitter: https://twitter.com/TatooineSons Like us on Facebook: https://www.facebook.com/TatooineSons Check out our Instagram: https://www.instagram.com/tatooinesons A PROUD member of the Star Wars Commonwealth Podcast Network: https://www.starwarscommonwealth.com Star Wars: Rebels REVISITED is a weekly, 30 minute look at Star Wars: Rebels! We believe this is the BEST Star Wars animated series, and we plan on proving it to you episode-by-episode and theme by theme! SPECIAL GUEST: Stephen Stanton - the voice of Ben Kenobi from Star Wars: Rebels Season 3, Episode 20 "Twin Suns!" (And Admiral Raddus from Rogue One; Wilhuf Tarkin in The Clones Wars; AP-5 from Star Wars: Rebels and MUCH more! On December 1, 2017, we setup a mic on our kitchen table and started talking about Star Wars. A year later, an we've reached our 50th Episode! 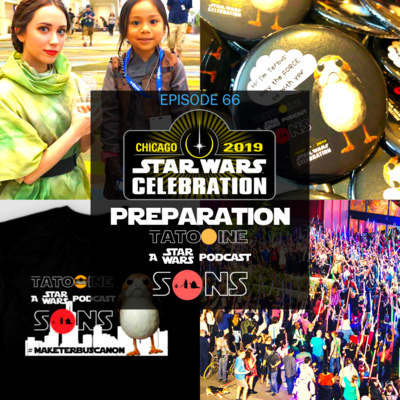 Join us as we talk all about our favorite moments from the year, including naming "Terbus" - the porg on the Millennium Falcon in The Last Jedi; getting endorsed by Rian Johnson, the writer/director of The Last Jedi; touring Lucasfilm headquarters and so much more! PLUS SPECIAL APPEARANCES FROM: Alex from Star Wars: Explained Jason Ward from MakingStarWars.net Dominic Jones from The Star Wars Underworld Kyle Larson from StarWarsNewsNet.com Steele Saunders from Steele Wars Podcast Jeffrey Fishbach from The Canto Cast Rob Cast from TSW Roundtable Steve Kirk from San Diego Sabers Radio Podcast Patreon Supporters And MORE! 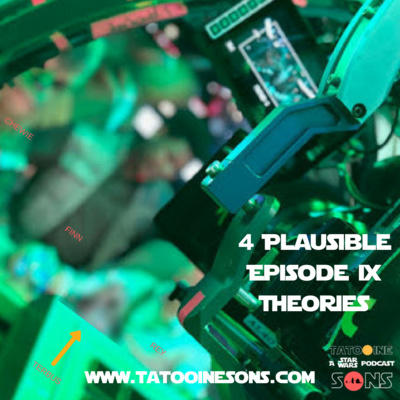 Learn more at www.tatooinesons.com Twitter: @tatooinesons Instagram: @tatooinesons Facebook: facebook.com/tatooinesons Support family friendly Star Wars podcasting at patreon.com/tatooinesons TIME STAMPS: 00:0) BB-N8 Tells How YOU Can Become A Patreon Supporter! 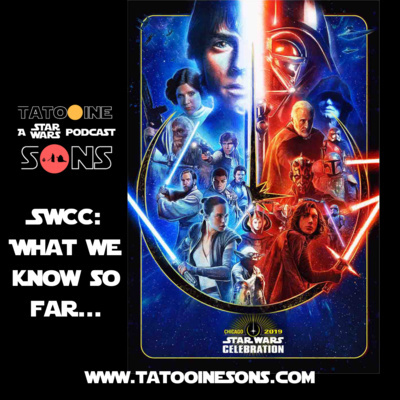 00:41 Check out the Star Wars Commonwealth Podcast Network 01:25 Dominic Jones of The Star Wars Underworld shares his favorite Tatooine Sons memory! 01:50 SPECIAL GUEST: Stephen Stanton 54:19 BB-N8's 1st Year Highlight: Terbus the Porg! 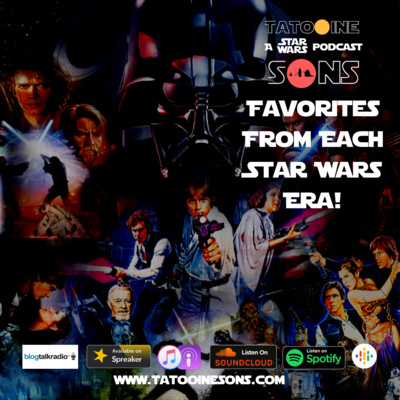 74:35 Favorite Tatooine Sons memories from the Star Wars Commonwealth Podcast Network! 81:47 Samuel the Hutt's 1st Year Highlight: Visiting Lucasfilm 103:29 Favorite Tatooine Sons memories from Star Wars Content Creator 127:54 Favorite Tatooine Sons memories from Tatooine Sons Patreon Supporters 130:47 Samuel the Hutt share how YOU can join these amazing Patreon Supporters! 132:14 Guest: Arnold Fitt Jr. tells how he ran into JJ Abrams and Oscar Isaac at the airport in Jordan 150:45 Hot Takes 166:09 Anything else 169:14 Thanks for listening! May the Force be with you! Welcome Star Wars fans to Episode 49 of Tatooine Sons! Kylo Ren is one of the most hated...and loved...characters in the Sequel Trilogy. Which is why we were surprised that most of the Star Wars fans we know don't really have a problem with him being "redeemed." We'll talk about if that can happen, and if it's possible, how. Plus, we'll give a preview of our special 1 Year Anniversary 50th Episode coming next week, and our normal Resistance Recap and Hot Takes. "You have too much of your father's heart in you, young Solo." It’s TIME for Tatooine Sons! TIME STAMPS: 00:02 - Nathan Patreon Clip 00:36 - SWC Podcast Network 01:56 - Episode 49 Intro 12:38 - Last Week's Podcast Poll Results - What's Your Biggest "Please DON'T" For Episode XI? (http://bit.ly/Ep9PleaseDont) 27:23 - Resistance Recap: Synara's Score 45:49 - Hot Takes: Oscar Isaac Talks Carrie Fisher / Is Ezra Bridger in Episode IX? / Ben Swolo Got it From Daddy! 58:24 - Is Ben Solo Redeemable? (http://bit.ly/Bendemption49) 01:24:02 - Anything else? 01:28:56 - Thanks for Listening! Super SHOUT OUT To our AMAZING Patreon Supporters! John Carse Robert Moreno Justin Beaman Judith Jesse Meghan Camp Nicole Murdoch Elaine Doebereiner Peter Ross Neil Lowrey Rebecca Diaz Rob Wade Bradley Hall Chris Miracle Tim Truax Steve Kirk Make sure you check out all of the members of the Star Wars Commonwealth Podcast Network! Go to www.starwarscommonwealth.com! To learn more about Tatooine Sons, go to www.tatooinesons.com! You can find our latest episodes, become a Patreon supporter, and by AWESOME Terbus the Porg merch! Welcome Star Wars fans to Episode 48 of Tatooine Sons! With Episode IX a little more than a year away, there are a TON of story possibilities that fans are hoping for...and against. From Reylo, to Bendemption, to time travel, fans have as many "Please Don'ts" as "Please Do's!" But what about back between The Empire Strikes Back and Return of the Jedi? What were the "please do's" and "don'ts" fans had then, and what ended up happening? We'll talk all about it! PLUS: we'll break down last week's episode of Star Wars: Resistance, give a preview of this Sunday's episode, and we'll share our "hot takes" from this week's news. "IT'S A TRAP!!" It’s TIME for Tatooine Sons! Super SHOUT OUT To our AMAZING Patreon Supporters! John CarseRobert MorenoJustin BeamanJudith JesseMeghan CampNicole MurdochElaine DoebereinerPeter RossNeil LowreyRebecca DiazRob WadeBradley HallChris MiracleTim TruaxSteve Kirk Make sure you check out all of the members of the Star Wars Commonwealth Podcast Network! Go to www.starwarscommonwealth.com! To learn more about Tatooine Sons, go to www.tatooinesons.com! You can find our latest episodes, become a Patreon supporter, and by AWESOME Terbus the Porg merch! BREAKING NEWS: Disney & Lucasfilm have announced a Cassian Andor series for the Disney+ Streaming Service! Hear our initial reactions & VOTE in our Twitter poll! Rian Johnson decided to chime in on a thread on last week's Podcast Poll of the Week, and Star Wars Twitter went into a mini-meltdown. The reason? Rian claims that the Luke Skywalker of The Last Jedi is consistent with the Luke everyone loved from the Original Trilogy. Is this true? We'll dive into that PLUS: we'll break down last week's episode of Star Wars: Resistance, give a preview of this Sunday's episode, and we'll share our "hot takes" from this week's news. (Oh... and we spent Thursday afternoon at Lucasfilm.) It's a JAM PACKED show! “You can’t stop the change, any more than you can stop the suns from setting.” It’s TIME for Tatooine Sons! Super SHOUT OUT To our AMAZING Patreon Supporters! John CarseRobert MorenoJustin BeamanJudith JesseMeghan CampNicole MurdochElaine DoebereinerPeter RossNeil LowreyRebecca DiazRob WadeBradley HallChris MiracleTim TruaxSteve Kirk Make sure you check out all of the members of the Star Wars Commonwealth Podcast Network! Go to www.starwarscommonwealth.com! To learn more about Tatooine Sons, go to www.tatooinesons.com! You can find our latest episodes, become a Patreon supporter, and by AWESOME Terbus the Porg merch! Variety Magazine is reporting that JJ Abrams is being asked by Lucasfilm and Disney to "fix" Star Wars. Is everyone's favorite space-fantasy saga in need of a course correction? We'll discuss that. PLUS: we'll break down last week's episode of Star Wars: Resistance, give a preview of tonight's episode, and we'll share our "hot takes" from this week's news. He's been legendary since the Star Wars Holiday Special in 1978. But NOW, we might be Forced (pun intended) to accept that Boba Fett is dead. We discuss this possibility, along with the future of the Star Wars anthology films. PLUS, we review Episode 4 of Star Wars: Resistance (Fuel for the Fire) and preview Episode 5 (The High Tower). And as always, we have our Podcast Poll of the Week, Hot Takes, and a couple of LIFE CHANGING announcements you DON'T want to miss! SPECIAL EPISODE! 10 Questions on Tatooine Tuesday with Star Wars Explained! Episode 30: Star Wars Fanboys Strike Back! It's been a crazy week for Star Wars fans! We'll see if we can make sense of the up and down reports about new films in development. And then talk about this bizarre movement to try to remake The Last Jedi. BB-N8 gives my review of the latest Poe Dameron comic. And Samuel the Hutt has some news about Jon Favreau's series. PLUS: The results from last week's Podcast Poll of the Week, "Hot Takes!" and more! “Help me, Obi-Wan Kenobi. You’re my only hope.” tatooinesons.com Twitter: @TatooineSons Facebook: facebook.com/tatooinesons YouTube: YouTube.com/tatooinesons Proud member of the Star Wars Commonwealth Podcast Netwowrk: starwarscommonwealth.com It's TIME for Tatooine Sons! Episode 29: A Celebration of Star Wars Fathers! 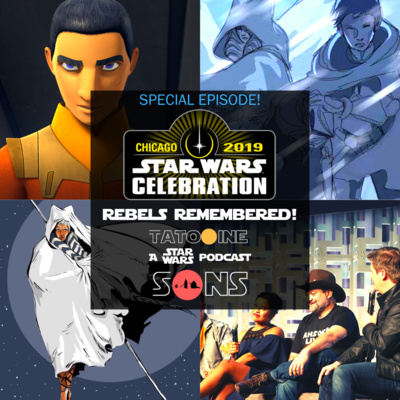 Episode 28: About that Maul Scene... Star Wars Celebration 2019! and More! Join us as we share our thoughts on the latest Star Wars movie: Solo - A Star Wars Story! Last Week's Podcast Poll of the Week How much ?? do you think #SoloAStarWarsStory will make on opening weekend? 34% - $150 million / 28% - $170 million / 38% - $180 million NON-SPOILER Reaction Solo SPOILER REACTION! What if... SPECIAL SOLO EDITION! n a scale of 1-10 (1 being bantha poodoo & 10 being one with the Force) what did you think about #SoloAStarWarsStory? https://twitter.com/TatooineSons/status/1000031908808478721 Anything Else? 1. Boba Fett movie? 2. Galaxy's Edge - Disneyland opening Summer of 2019 3. Is Poe Dameron "Force sensitive?" Episode 25: SOLO Predictions (Serious and Crazy)! PLUS a Special SOLO What If? We're a week away from the release of Solo: A Star Wars Story! This is our special PREVIEW episode! YAAAAYYY!!!! First, we will share our serious predictions about what we believe will happen with Han, Chewie, Lando, and the rest of the crew. Next, we will make our famous "Predictions Sure to Go Wrong!" Finally, we'll answer the question, "What if Han Solo and Chewbacca never met?" Plus a lot more (you never know what we'll come up with on the fly!" MTFBWY! Episode 24: Solo Red Carpet Premiere LIVE! Episode 23: Star Wars Nite! Solo CLIP! & What if Ben Kenobi Survived? Last week's Podcast Poll of the Week: Will we get a Star Wars surprise on May the 4th? Results HERE! Segment 1: We had the chance to attend Disneyland After Dark: Star Wars Nite on May 3-4! We share our thoughts on this fun experience, along with a few comments on things that could have been done better. And we're one of the frist to review the new Rey character meet and greet1 Segment 2: We DID get a Star Wars surprise on May the 4th! Disney released a clip from Solo: A Star Wars Story (see the clip here!) We talk about what happens in the clip (No real "spoilers" but listen at your own risk!) Segment 3: What if Ben Kenobi escaped from his confrontation with Darth Vader, and escaped with the Millennium Falcon? We share our thoughts on this scenario! This week's Podcast Poll of the Week: Will you stay "spoiler free" before watching Solo: A Star Wars Story? Vote Here! Support our podcast here! Episode 22: Join the Resistance! More SOLO Coming? What if...? Podcast Poll of the Week: When do you think tickets for Solo: A Star Wars Story will go on sale? Results here! We called it! The next animated series from Lucasfilm is coming in the Fall, and we predicted its name months ago! Star Wars: Resistance! What do we think will happen? http://www.starwars.com/news/star-wars-resistance-set-for-fall-debut Alden Ehrenreich gave an extended (reeeeaaaallllyyy extended *yawn) interview with Esquire. We breakd down the highlights, including BB-N8's unsual prediction for new Solo appearances in movies NOT about our favorite scoundrel! And we decided it was time to ramp up our "What if" segment. So, what if Luke, Leia, Han and Chewie didn't make it out of the trash compactor? If you're a fan of The Clone Wars, you want to listen to this segment! Podcast Poll of the Week: Will we get a Star Wars surprise on May the 4th? VOTE HERE! Learn more about Tatooine Sons HERE! Episode 21: Kasdan's Talk Solo! New Solo TV Spots! What If Greedo Shot First? Results of last week's Podcast Poll of the Week: On a scale of 1-10 (10 being PERFECT), what's your score for the full Solo: A Star Wars Story trailer? 1-3: 4% 10: 19% 4-6: 20% 7-9: 57% Father and son writing team, Lawrence and John Kasdan, were on The Star Wars Show this week sharing about their favorite Star Wars character, Han Solo. Watch the clip here! We break down the new TV spots for Solo: A Star Wars Story! First, we look at CREW! Second, we look at RISK! We discuss our thoughts on the question, "What if Greedo REALLY DID shoot first, and KILLED Han Solo?" New Podcast Poll of the Week: When do you think the tickets for Solo: A Star Wars Story will go on sale? Before May the 4th? On May the 4th? Of after May the 4th? VOTE HERE! Learn more about Tatooine Sons HERE! Episode 20: Solo Trailer Reaction! Questions from Kids! And What If? Episode 19: Kid Questions!! JJ's Plan for Rey's Parents! Rian's New Trilogy! Episode 18: Thrawn Goes to Batuu! Holdo Has the Force? & Behind the Scenes Info! Last Week's Poll: https://twitter.com/TatooineSons/status/977615663651934208 New Patreon Supporters: Matthew Rumball & Elaine Doebereiner - $5 Support HERE! We get things started by talking about something we learned from the excerpt of the new novel Thrawn: Alliances, being released this July! ARTICLE HERE First, we talk about Laura Dern’s revelation that Vice Admiral Holdo is “force sensitive.” What do you think about it? ARTICLE HERE We want to hear what you think! Send us an MP3 comment with your thoughts to TatooineSons@yahoo.com last week Mark Hamill shared that George Lucas’ original plan for the sequel trilogy involved killing of Luke Skywalker, but not until Episode IX. ARTICLE HERE New Poll: Would you like to see Meryll Streep replace Carrie Fisher in Episode IX? VOTE HERE! Episode 15: SPOILERS! Star Wars Rebels Finale Reaction! Episode 14: Rebels Reaction! A NEW Animated Series! And May the 4th be With Us? Episode 13: DUME! The Resistance! & Mark Hamill Finally Gets a Star! Welcome Star Wars fans to Episode 13 of Tatooine Sons. This week, we’re going to reveal a theory about Star Wars Rebels that is going to melt your face off! Next, give our guesses about what the next Lucasfilm trademark might mean. And finally, we’re making our plans to see Mark Hamill finally receive a star on the Hollywood Walk of Fame. “Loth Rat, Loth Cat, Loth wolf, run. Pick a path, and all is done.” It’s TIME for Tatooine Sons! Episode 12: Our Star Wars Rebels Predictions! Game of Thrones in Star Wars? LEGO Millennium Falcon! Episode 11: Solo - A Star Wars Story Trailer Breakdown! WARNING: Driving while listening to this episode might be dangerous! (We wouldn't want you to drive off the road!) Sunday, we learned that we had been invited to IMAX Headquarters to a special screening of The Last Jedi, followed by an extended conversation with Rian Johnson. This is the story of that amazing day. Make sure you listen all the way to the end. It's truly unbelievable! Episode 8: Leia, Solo Synoposis, & Star Wars Rebels Revelations! 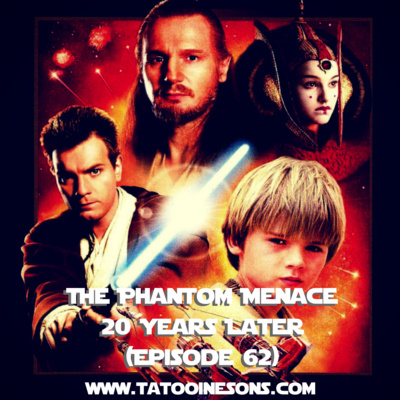 Welcome Star Wars fans to Episode 8 of Tatooine Sons! This week, we're sharing our thoughts on Carrie Fisher's final performance as Princess Leia! Lucasfilm released a synopsis for SOLO: A Star Wars Story - we'll discuss what it does and DOESN'T say! And after months of anticipation, Disney gave us a midseason trailer for the final episodes of Star Wars Rebels. Let's just say, we're pretty excited! "Our long awaited meeting has come at last." It's time for Tatooine Sons! Episode 7: The REAL VILLAIN of The Last Jedi! In the last week, a rumor has started going around that Poe is the REAL VILLAIN of The Last Jedi! We look at his story arc and discuss what we think about that idea! https://nerdist.com/poe-dameron-villain-star-wars-last-jedi/ We've FINALLY gotten a release date for the second half of the FINAL season of Star Wars Rebels (February 24)! And we also now know the titles of episodes 10 and 11. Let's just say - they're a bit shocking! We give our thoughts on what we believe will happen in the final episodes of the series! 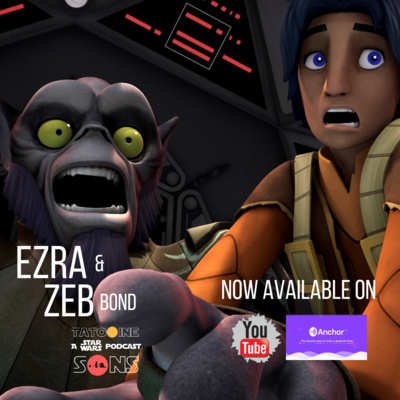 https://screenrant.com/star-wars-rebels-season-4-return-description-death/ And the Lucasfilm Story Group was on a special episode of The Star Wars Show! They shared their favorite "secrets" from The Last Jedi. We share which were our favorites! 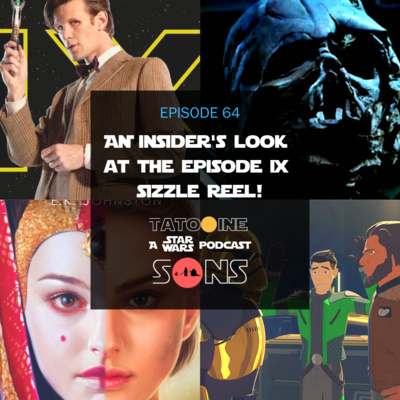 BONUS: We announce a SPECIAL OPPORTUNITY to become a "patron" of Tatooine Sons, along with access to a special podcast each week! More details here: https://www.patreon.com/tatooinesons It's time for Tatooine Sons! Follow us on Twitter: https://twitter.com/TatooineSons Like us on Facebook: https://www.facebook.com/TatooineSons/ Subscribe to us on YouTube: http://bit.ly/2sQw3oy May the Force be with you! Episode 6: Finn's Heroic Journey! Solo Lego Leak! and Legendary Characters Appearing in Solo! Episode 5: Rey, Old & Sequel Trilogy Parallels, & Crazy Fan Reaction to The Last Jedi! Episode 4: A New Luke! Is Reylo dead? And the Countdown to Solo Begins! Episode 3: SPOILER FILLED The Last Jedi Reaction! It's finally out! The Last Jedi is in theaters and the response from fandom is all over the place! Some believe it's the best Star Wars movie since The Empire Strikes Back! Others think that Rian Johnson, Kathleen Kennedy and Lucasfilm have totally sold out to the Disney machine. Join BB-N8 (Nathan Jesse), Samuel the Hutt (Sam Jesse) and The Bow Tie Jedi Guy (David Jesse) as they share what they loved about the latest Star Wars movie, including a different perspective on Rose (Kelly Marie Tran) and Finn's (John Boyega) trip to Canto Bight and back! Follow us on Twitter: https://twitter.com/TatooineSons Like us on Facebook: https://www.facebook.com/TatooineSons/ Subscribe to us on YouTube: http://bit.ly/2sQw3oy May the Force be with you! The Last Jedi LIVE from Opening Night! The release of The Last Jedi is just a few days away! On our second episode, BB-N8 (Nathan Jesse), Samuel the Hutt (Sam Jesse) and The Bow Tie Jedi Guy (David Jesse) share their wishes for they want to see in the latest Star Wars saga movie! Next, they go into the bizarre but still plausible idea of a romantic relationship between Rey (played by Daisy Ridley) and Kylo Ren (Adam Driver). Is there more than just a Force connection between the protagonist and antagonist of the Sequel Trilogy? Finally, we give our craziest The Last Jedi predictions sure to go wrong! Is Luke Skywalker on Ach-To in order to train an army of Force-sensitive Jedi porgs? Is Snoke really a hairless Chewbacca from the future? Follow us on Twitter: https://twitter.com/TatooineSons Like us on Facebook: https://www.facebook.com/TatooineSons/ Subscribe to us on YouTube: http://bit.ly/2sQw3oy May the Force be with you! Epsiode 1: Snoke, Kylo Ren, and Rose Tico!